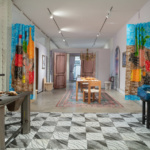 It’s not often that one can step into a real-life dollhouse, but Blow Up, the recent exhibition at Friedman Benda, curated by New York-based curator and PIN-UP founder Felix Burrichter and designed by Charlap Hyman & Herrero, offers just that, transforming the gallery into an exercise in feeling out of scale. After spending time in the exhibition (which closed February 16, 2019), you may not only question your own spatial reality, but also your temporal one. 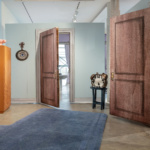 The curation of furniture and objects in the exhibition—complemented by its design, which transforms the white box gallery into four rooms arranged in enfilade with walls made out of cardboard panels—will make visitors rightfully question whether it is a scaled-up version of an imaginary world or whether the real world is a scaled-down version of our imagination. 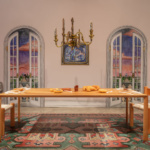 In the show’s accompanying publication, Blow Up Diary, edited by Drew Zeiba, exhibition designer Adam Charlap Hyman describes a childhood fascination with miniatures and dollhouses, and explains his attraction to the way “the disconnect between representation, reality, and scale, was confused” in them. 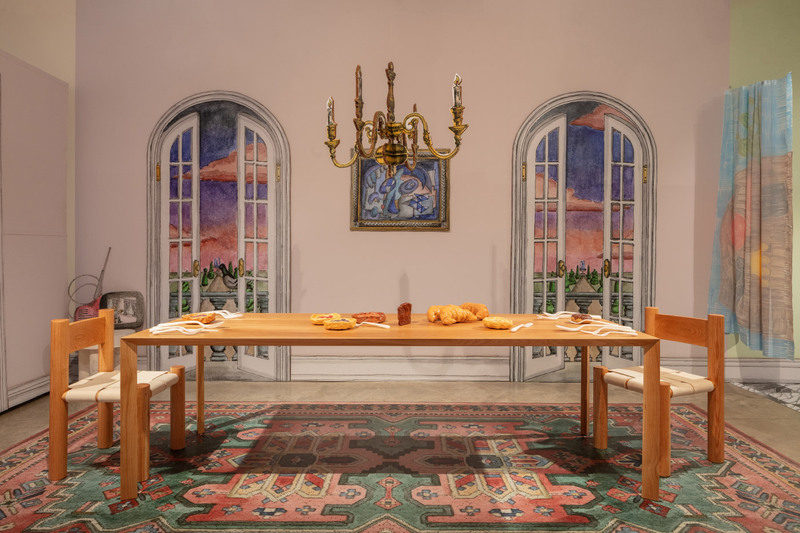 This is an obsession in the work of Charlap Hyman and his partner, Andre Herrero, most clearly demonstrated in their contribution to the 2017 Chicago Architecture Biennial, in which they presented three small shoebox-size models of Yves Saint Laurent and Pierre Bergé’s Paris apartment at three different stages of packing their art collection for auction at Christie’s. By representing the same space at different points in time, the models foreground the passage of time as another way of understanding an interior space. Ghosted outlines of picture frames taken off the walls accentuate the dust and debris that accumulate around the paintings once they are removed, leaving us with Charlap Hyman’s gouache illustrations of the interior walls of Bergé’s Paris apartment. 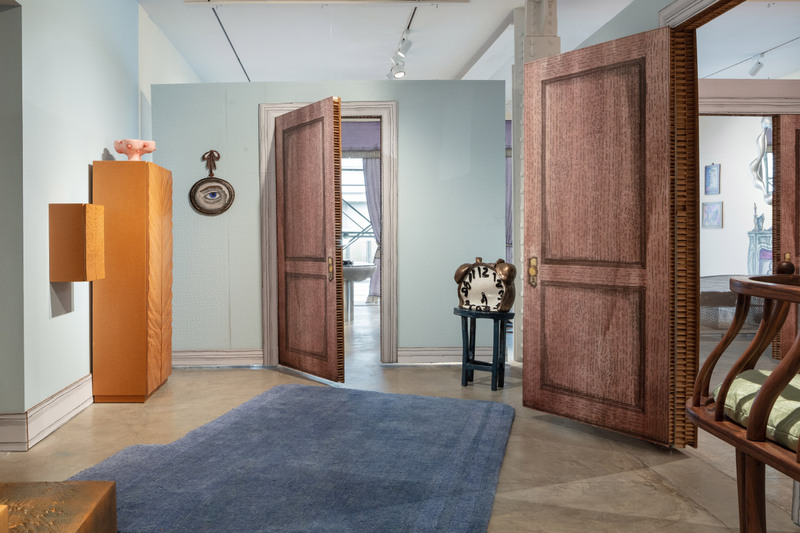 This chronological dysphoria creates strange combinations of objects, as if each room is host to a tableau of a multigenerational family conversation; these strange adjacencies of time and form produce the most jarring and exciting moments in the show. 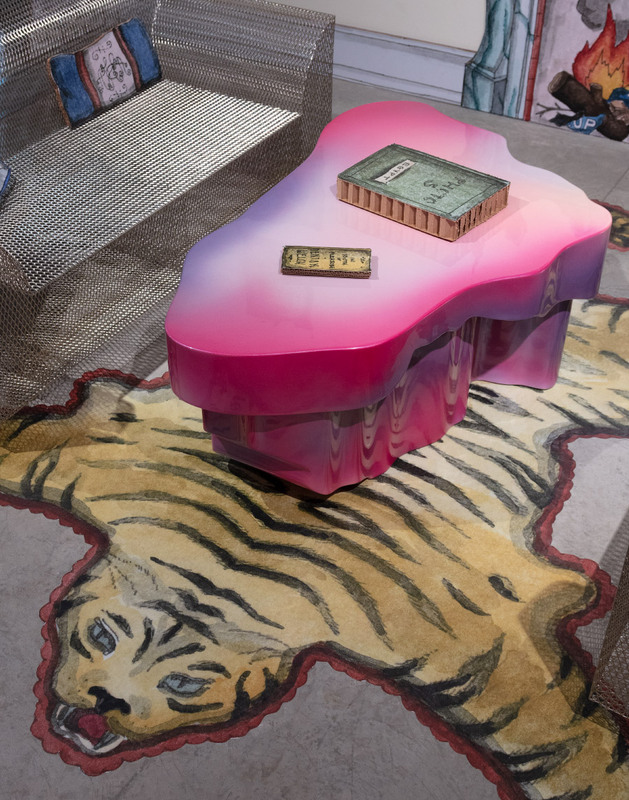 In the “living room” of the installation we find Leon Ransmeier’s Two Step (2018), a rolled-aluminum lounger that sits directly on the floor, flanked on one side by a pair of Shiro Kuramata’s iconic 1986 steel mesh couches, titled How High the Moon, and Odd Matter’s saccharine pink and purple, amoeba-shaped Guise 5 Spray Coffee Table, the Netherlands, and on the other by Wendell Castle’s bulbous Cloud Form Desk from 1979 and a pair of checkered Sarah Ortmeyer paintings, GRANDMASTER III and GRANDMASTER V, both from 2018, which give the whole thing a slightly Beetlejuice feel. Another subtle hint of time-flattening dysphoria are the gouache “paintings” on the wall, drawn by Charlap Hyman with the same fervent handmade style as his 2017 Chicago Biennial illustrations, but in the style of different artists of the 20th century, from Henri Matisse to Wassily Kandinsky to Paul Klee. If one looks carefully, one also notices the bookshelf in the “living room,” with titles like Thomas Mann’s Death in Venice and a canon of queer literature for the imagined prepubescent doll-house owner. Continuing the contrast in color are Don’t Fold Young Boy, by young designer Dozie Kanu, a piece somewhere between a stepladder and a bookshelf constructed from Rimowa Aluminum sheet and steel, and artist Misha Kahn’s Saturday Morning Series: Tumbling in Turmoil (2018), a silver mirror cast in urethane resin from tensile fabric forms. Artist Camille Henrot’s piece Maso Meet Maso consists of a bulbous purple phone resting on a side table, while in the bedroom another wall-mounted custom telephone piece by Henrot, Dawg Shaming, invites the visitor to pick up the handset and eavesdrop on a conversation between the two phones. 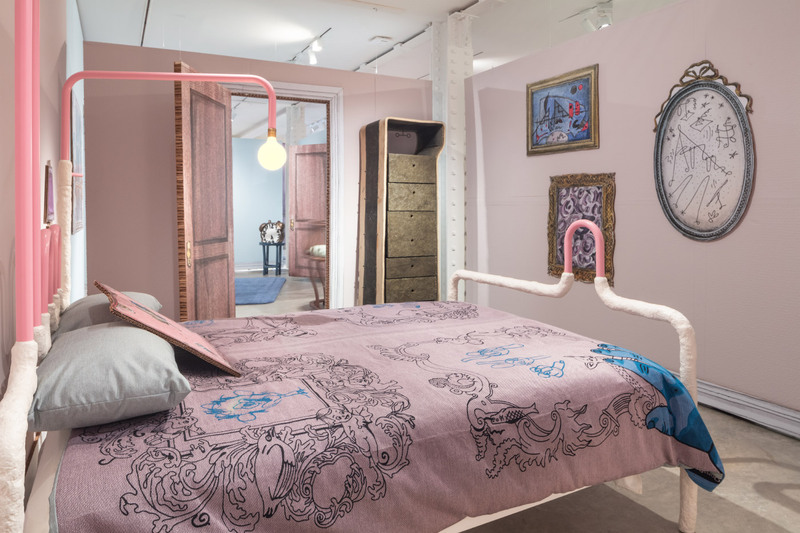 The bedroom conjures a Dr. Seuss–like vibe, with the delightfully strange combination of a loopy pink tube bed frame and light, Fruiting Habits, by Jonathan Trayte, covered in a textile piece by Oona Brangam-Snell, titled Grand Baby Bedding Set, which mixes childlike drawings with a repeated pattern reminiscent of a family crest. 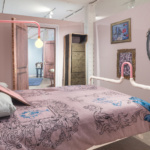 The bed is accentuated by Gaetano Pesce’s Felt Cabinet lurking in the corner, which faces an understated Ultrasuede bench by Rafael de Cárdenas / Architecture at Large called Untitled (ba ba ba) (2018), a piece that rounds out the generational conversation in the bedroom with its cool, calm poise. 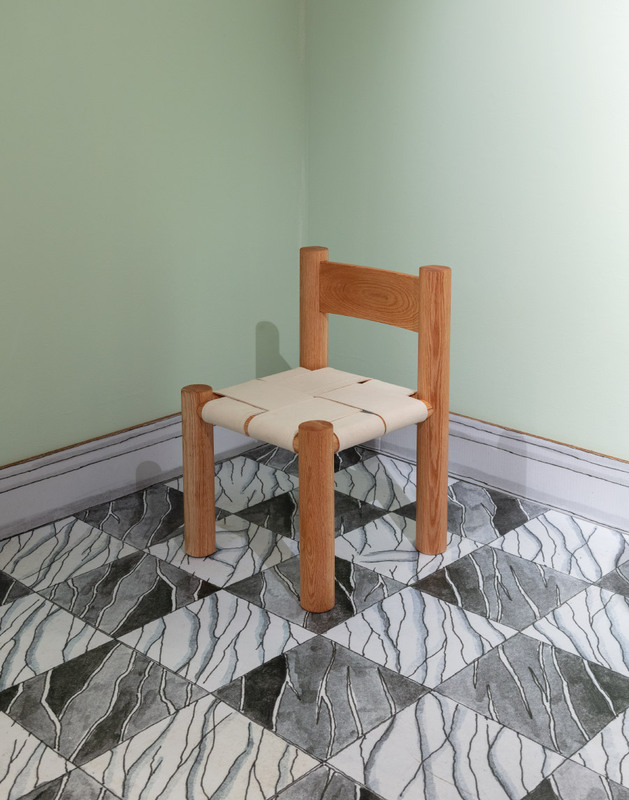 Further mash-ups of scale are presented in the “dining room,” with designer Katie Stout’s Tinder Chair and German-Moroccan design duo BNAG’s Toilet Chair and Tubbie Chair—the latter is a scaled-up version of a wooden chair from the 1990s children’s television show Teletubbies, which can be seen as a naive, happy-go-lucky children’s education show or, as in this case, a source of psychedelic inspiration. 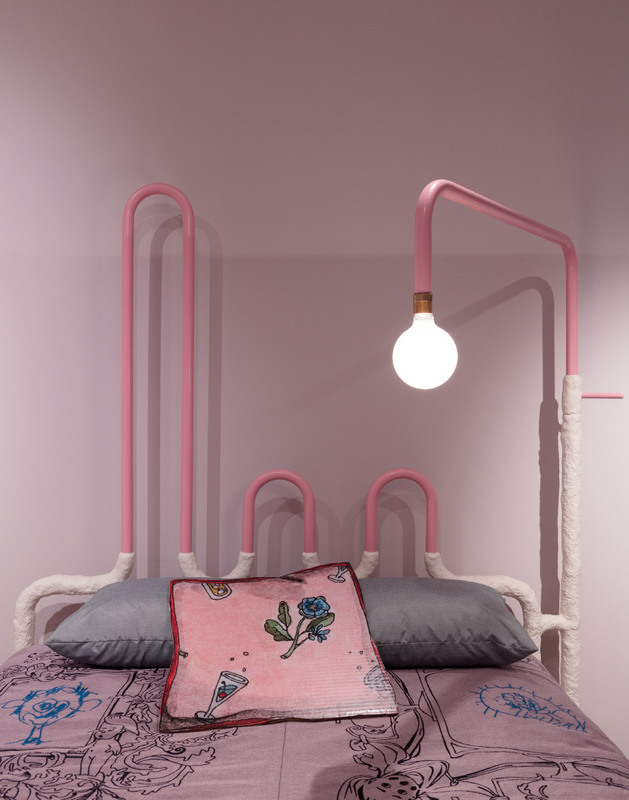 Milanese architect Luca Cipelletti’s no-nonsense XYZ table anchors the room. 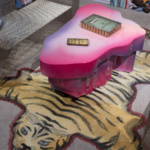 Overall, the show illustrates a stark contrast between flamboyant designs from the gallery’s collection and the specially commissioned contemporary pieces, which are relatively restrained and exude a humble quality rather than shouting for attention. 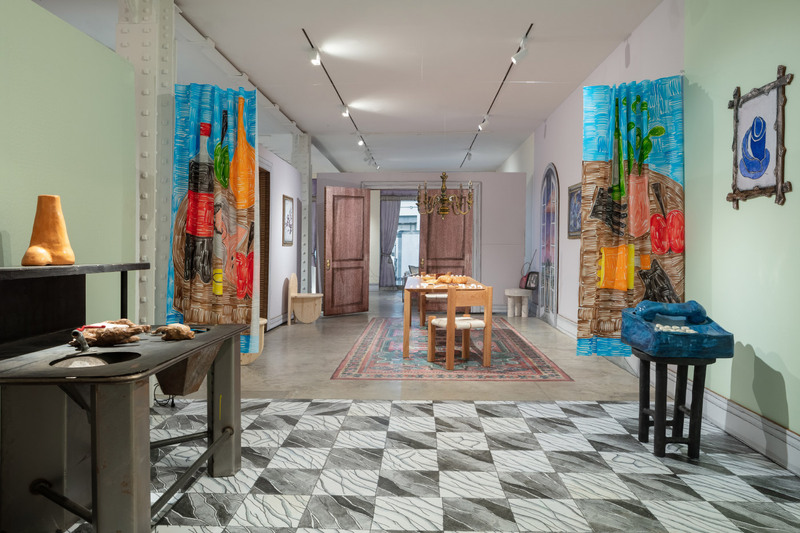 While this sounds like a throwback to the stripped-down ethos of the Arte Povera movement, the actual effect is one of newfound sobriety, a coolness that avoids looking sleek and loud in favor of simply fulfilling a function beautifully.